Southwest entrance to Library East on the University of Florida campus. Scanned. No deterioration. 35 mm. 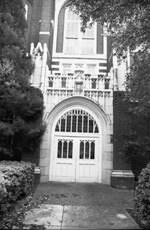 Original west entrance to the University of Florida's University Library before the south tower addition. Photograph 4124 from the University Archives Photograph Collection.